Game theory suggests that it’s sometimes rational to behave irrationally. 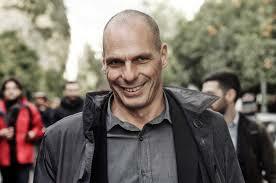 Case in point: Yanis Varoufakis, the Greek finance minister. Varoufakis’ country is nearly bankrupt and other European community nations – especially Germany – hold the keys to any bailout. So you might expect Varoufakis to behave contritely toward his potential saviors. Far from it. Instead, he seems determined to make his opponents recoil in disgust and horror. Varoufakis wears a black leather jacket (gasp!) to high-level ministerial meetings and lectures and hectors his fellow finance ministers. He’s rude, he shows up late, and his behavior borders on the bizarre. He alienates the very people who are poised to bail him out. In other words, he’s a very shrewd negotiator. A Greek exit (Grexit) from the euro would create hardships for Greece and every other country in Europe (and perhaps far beyond). The European finance ministers claim that a Grexit would be much more “contained” than it would have been three years ago. But nobody knows for sure. It could spark a widespread panic. Nobody wants a Grexit. But nobody can afford to give in either. Greece wants the bailout as long as it doesn’t include onerous conditions related to austerity and labor reform. Germany and the rest of the EC want to bail out Greece as long as they can claim that they’ve forced reforms on their wayward neighbor so that it will never happen again. Nobody wants a Grexit but both sides want a certain amount of theater. As we learned the other day, behaving irrationally can cause the opposition to restrict their thinking and forego some options that might otherwise be perfectly acceptable. This is exactly what Varoufakis wants. Both sides want to push the issue to the brink so they can tell their voters that they got the best deal possible. I expect two more weeks of theater followed by a compromise that no one likes but everyone can live with. In theory, it’s just a game. There was Germany, a couple years ago, also telling the Greeks they should sell their islands. They cast themselves as the villian to Greece. I also recall that Iran released the US hostages the minute Regan was elected President. He was considered eager & irrational regarding pushing the red button.